Trojan's deep-cycle Absorbed Glass Mat (AGM) maintenance-free batteries feature a number of design elements to provide optimum performance. Robust plates and separators extend the life-cycle of Trojan's deep-cycle AGM batteries while a computer-generated grid design is optimized for high-power density. 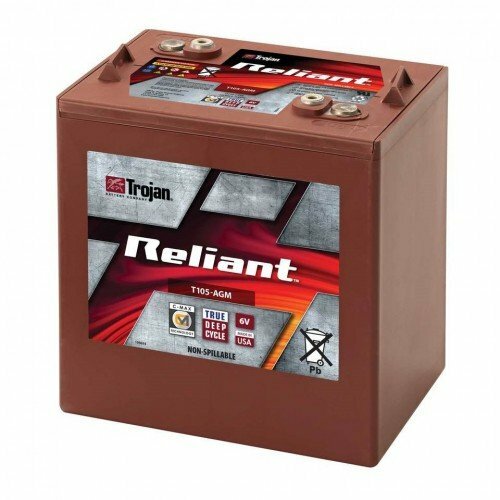 Trojan's deep-cycle AGM batteries are low temperature tolerant, shock and vibration resistant and have a low internal resistance for higher discharge current and higher charging efficiency. 10.30" L x 7.06" W x 10.73" H weight = 68 lbs. ea.